Welcome on board the VIP Cessna Grand Caravan and make your safari as exceptional as the destination. Enjoy a unique combination of adventure and relaxation with select accommodations and gastronomic delights as you are whisked between well-known game parks rich with wildlife. A private transfer from your hotel and transfer to the Nairobi’s Wilson airport to board your northbound flight to Shaba Game Reserve. Upon arrival at the airstrip, your guide welcomes you and transfers you to Joys Camp, built on the site of Joy Adamson's tented home in Shaba National Reserve. The site was also home to Penny the leopard, the heroine of her last book. The camp overlooks a large natural spring where elephant and lion jostle for watering rights with herds of buffalo. After lunch at camp you experience your first game drive. Enjoy a day of game drives in Shaba Game reserve. The area is famous for its rare desert species – especially striped hyena and aardwolf, Beisa oryx, reticulated giraffe, Grevy's zebra and the elegant gerenuk. The Uaso River flows through the heart of Shaba Game Reserve and offers year round water for the various wildlife that inhabit this park. 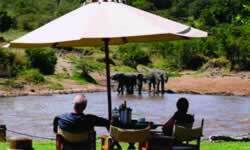 Joys camp is set ideally overlooking a large natural spring where elephant, lion and buffalo often frequent. After your early morning bush breakfast on the banks of the Uaso River, check-out and board your luxury Cessna to fly to Naivasha; flying along the Uaso River and then past the Aberdare Mountains and across the Great Rift Valley. On arrival you are met and transferred from the airstrip to Chui Lodge (or Kiangazi House) where on the way admire the beautiful scenery and the free roaming wildlife. 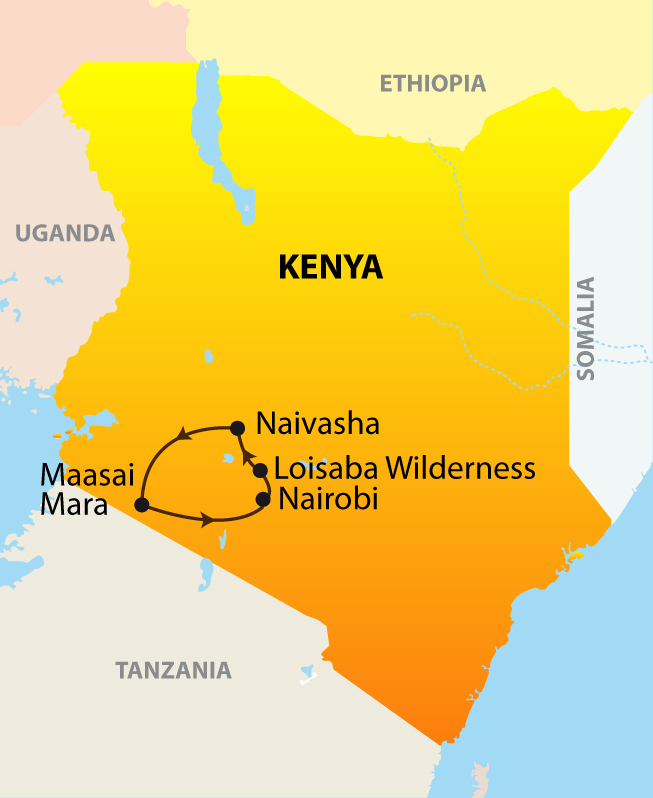 The camp is located in the private Oserain Wildlife Conservancy. After a sumptuous lunch at the lodge enjoy a game drive on the conservancy. After breakfast, take a serene morning boat ride on Lake Naivasha. Later, drive back to your camp for lunch and some time to relax and enjoy the wonderful panoramic views from the lodge. In the afternoon go on a game drive through the conservation area. When the sun starts to go down enjoy a bush sundowner and on your way back to the camp experience the Kenyan savannah at night – a unique experience. Enjoy a bush breakfast on the shores of the lake as you watch hippos, birds and wildlife around you. After breakfast, check-out and fly to the world famous Maasai Mara. Your guide welcomes you at the airstrip and drives you to Karen Blixen Camp. Set on the bank of the Mara River the camp consists of 22 luxurious tents. The location is spectacular, with the great Mara plains behind the camp and the impressive escarpment and the river in front. After lunch at camp you experience your first game drive. During the day, you go on a game drive through Masai Mara. The game reserve is best known for its wildebeest and zebra migration, which tends to pass through the area July to October, but many areas offer excellent game viewing year round. Lunch will either be at the camp or picnic lunch in the park. We offer you the option to go on a balloon safari (surchargeapplies) and to enjoy the bird’s eye view of Kenya. Spend the day exploring the vast wildlife areas of the Mara North Conservancy, a beautiful private wilderness area of more than 30,000 hectares. It is a vital part of the Masai Mara ecosystem as it forms the north-western zone, bordering the Masai Mara National Reserve in the south of Kenya. Professional management ensures guests of a truly exclusive and private safari experience with a very low vehicle density. The Masai Mara is famous for its unique concentration of wildlife, birds, rich vegetation and open savannah. It has been classified one of the "Seven Wonders of the World" due to the extraordinary annual migration (July October) when over 1.3 million wildebeest and zebras cross from the Serengeti to the Maasai Mara in search of greener pastures. Less famous, yet very impressive, is the Loita Hills migration, where thousands of local wildebeest come to the Mara North Conservancy between December and May. Notes: Maximum baggage is 20kg (including carry-on) in soft-sided luggage per person. No hard suitcases or bags with wheels.